Rain didn’t stop Cedarville University’s men’s soccer team from winning, Sept. 8 at the Athletes in Action Sports Complex in Xenia. XENIA — Sammy Kilimann scored late and Carter Selvius stood tall in goal as the Cedarville University Yellow Jackets outlasted Malone, 1-0, in blustery conditions of a Great Midwest Athletic Conference match Sept. 8 at the Athletes in Action Complex. The doubleheader with the women was moved to AIA’s artificial turf due to excessive rain in the Cedarville area. Kilimann looped in a 20-yard shot on the run over the head of the Pioneers’ keeper in the 83rd minute. Bryce Childers was credited with the assist. That’s all the Yellow Jackets would need to improve to 3-1-1 overall and 2-0-1 G-MAC thanks to Selvius, who made three sterling saves in the second half. Both teams managed three shots on goal. The Jackets totaled more shots overall, 12-7. The Cedarville area received more than four inches of rain during the day. The Yellow Jackets hold a 38-13-5 lead in the all-time series that dates back to 1966. The next game for the team is 7 p.m. Wednesday, Sept. 12 at Ashland. 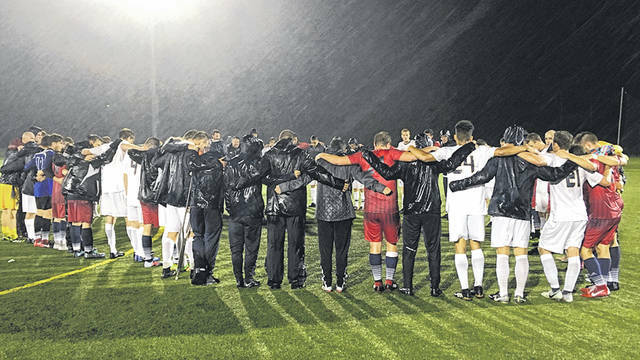 https://www.fairborndailyherald.com/wp-content/uploads/sites/50/2018/09/web1_cumen-1.jpgRain didn’t stop Cedarville University’s men’s soccer team from winning, Sept. 8 at the Athletes in Action Sports Complex in Xenia.